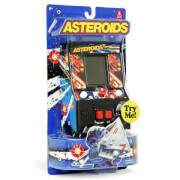 It’s a blast from the past with this retro-styled Asteroids Mini Arcade Game! It looks, sounds and plays just like you remember. Maneuver your space ship to avoid and shoot down asteroids before they slam into you! Joystick and fire buttons work just like the original. Includes 2 AA batteries.